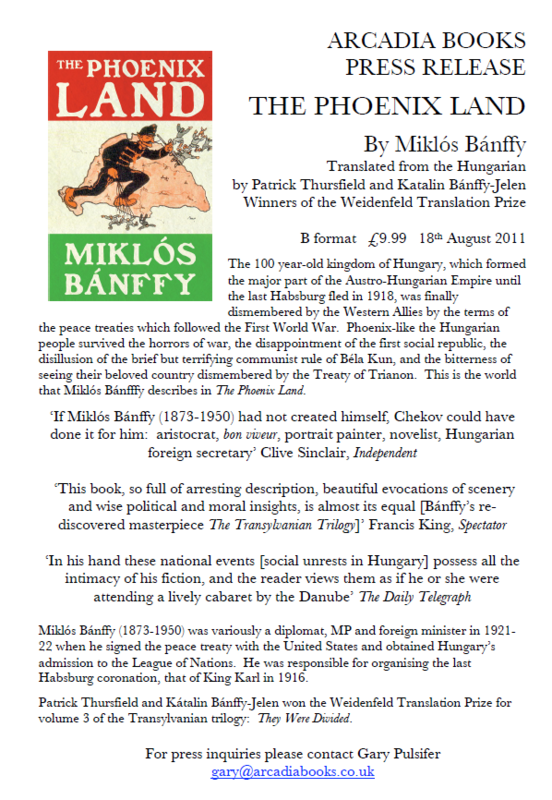 A reminder that Arcadia Books will be republishing Count Miklós Bánffy’s memoirs “The Phoenix Land” in June 2011. The book is already available for pre-order in bookshops such as Waterstones in the UK. and of course on Amazon. Arcadia first published this in 2004 and you can read a Spectator review here. When I worked at Peter Owen Publishers I was invited to Tangier by the Hon David Herbert, one of Peter’s authors. He took my partner and me to lunch with his neighbour Patrick Thursfield, who as you know is the Bánffy co-translator. After lunch Patrick gave me the manuscript of THEY WERE COUNTED, which I read while I was on holiday, and was hooked. I tried to persuade Peter Owen to publish the trilogy, but no go, so when I started Arcadia in 1996 volume one was one of our early titles. I became quite close to Patrick, stayed with him in Tangier and saw a lot of him in London and he even once came along to the Frankfurt book fair. He was overjoyed when THEY WERE DIVIDED won the Weidenfeld Translation Prize (this happened at an awards ceremony in Oxford, when Umberto Eco presented the prize). A funny aside is that Paddy’s forward was written in longhand and he came into our tiny offices to have Daniela de Groote, now our associate publisher, word-process it. Daniela, who is Chilean, hadn’t been in the UK all that long – she had been studying for a PhD here prior to working at Arcadia – and she had some difficulties in understanding Paddy’s upper crust accent as he dictated the foreword. Daniela was also catching a plane to Santiago that afternoon and the whole thing was a little much for her. So much so that I had to leave the office until they were finished . . . This entry was posted in Other Writing and tagged Between the Woods and the Water, Miklos Banffy, Patrick Leigh Fermor on June 19, 2011 by proverbs6to10.